From this kaleidoscopic range of topics and creators emerge four American tableaux, interwoven with no fewer than ten world premieres. Click here to get your tickets! Featuring travel songs by Barber, Berlioz, Blangini, Duparc, Haydn, Poulenc and Schubert, the Mirror Visions Ensemble sings its way to far-flung destinations, real and imaginary. MVE commissions by Tom Cipullo and Gilda Lyons round out the program, with settings of the poetry of Baudelaire, Joyce and Metastasio, and the correspondence of Edna St. Vincent Millay. More details here. MVE performs its commission from composer Francine Trester, inspired by the etchings of recluse artist Sheridan Oman of the American Southwest. More details here. 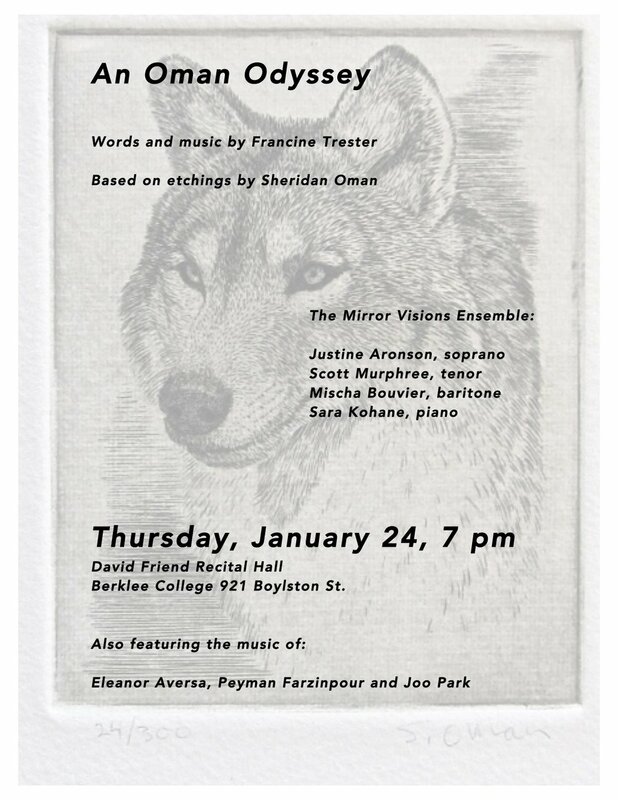 Join Mirror Visions Ensemble for an evening of art song that playfully and seriously explores the animalizing (and humanizing) that can arise under the sway of beasts and brutes. Featuring three MVE commissions, the program also includes Tchaikovsky, Handel, Poulenc and Hanns Eisler. The time has come for song to stand up! Baritone Jesse Blumberg and pianist Gary Chapman give a special, intimate concert. Contact mirrorvisions@gmail.com for tickets! Join MVE for an afternoon of art song that playfully and seriously explores the animalizing (and humanizing) that can arise under the sway of beasts and brutes. Featuring three world premieres from composers Francine Trester, Scott Wheeler and Christopher Berg, Guest Artistic Director Richard Lalli’s program also includes Tchaikovsky, Handel, Shostakovich and Hanns Eisler.